A 41 year old woman presents to your ED not long after injuring her right index finger while feeding a garden full of vegetables to her Super Duper blender. After conducting a thorough neurovascular evaluation and examination of the digit, you decide that she is a suitable candidate for repair of her superficial lacerations. She also has a very nice French manicure and hopes that you can find a way to avoid getting any blood, Betadine, or other chemicals on her other fingers. You tell her that you are up to the challenge and begin to gather your supplies. Finger lacerations are notoriously difficult to repair when adequate hemostasis is not achieved. 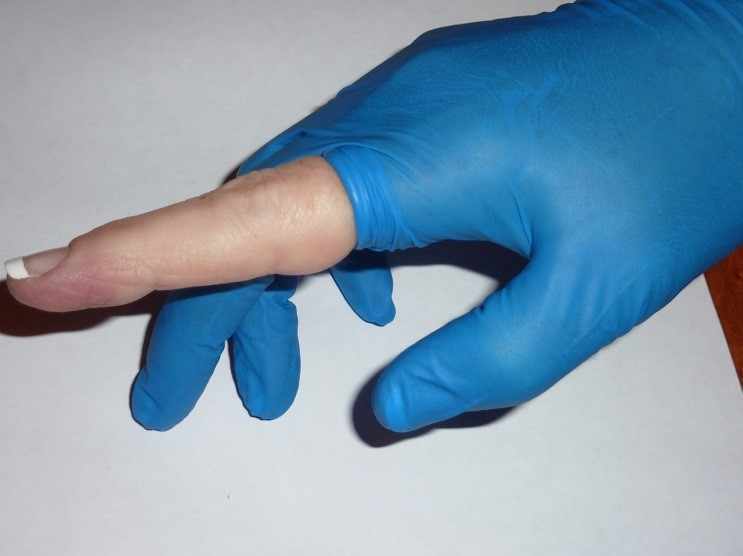 Though there are several commercially manufactured finger tourniquets available, these are often hard to find in a busy ED and rarely provide additional benefit over some of the tricks shared below. Here we will talk about a few options for making an “on the spot” tourniquet and also cover a few anecdotes that help facilitate a clean, painless, and effective repair that make this procedure a joy to perform. Start with a small wheal on the palmar aspect at the base of the proximal phalanx of the digit using ~0.5 mL; keep the needle in the skin. Slowly dive downwards on either side of the phalanx until you see a bit of tenting on the palmar side. After withdrawing to confirm avoidance of an intraarterial injection, flood the area with abundant lidocaine. Repeat on the opposite side. Take the needle to the fat pad on the palmar side and dump another good amount. Tourniquet time. My favorite tourniquet technique, first taught to me by an EM physician at Dartmouth, has some key advantages over other methods. 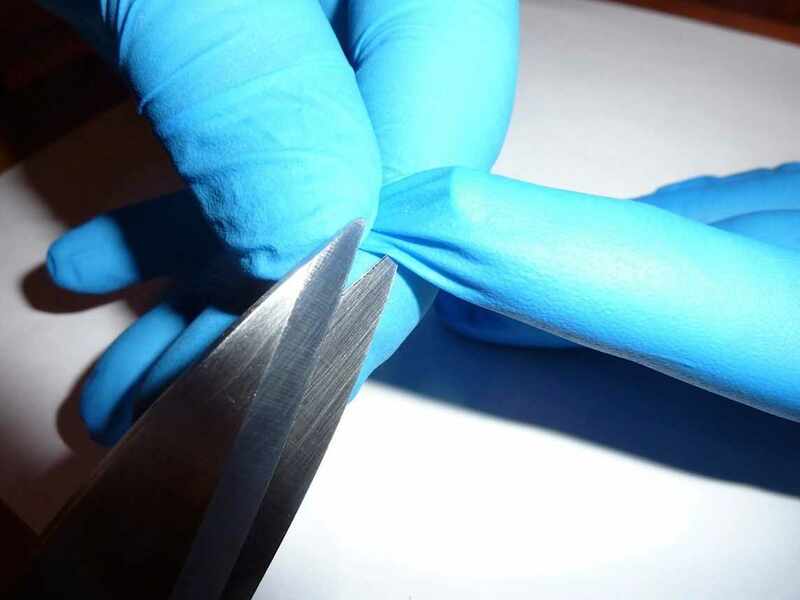 It uses a ubiquitous resource that is available anywhere—the standard non-Latex glove. It helps keep blood and Betadine off of other fingers while you clean and repair, which leads to a happier patient. 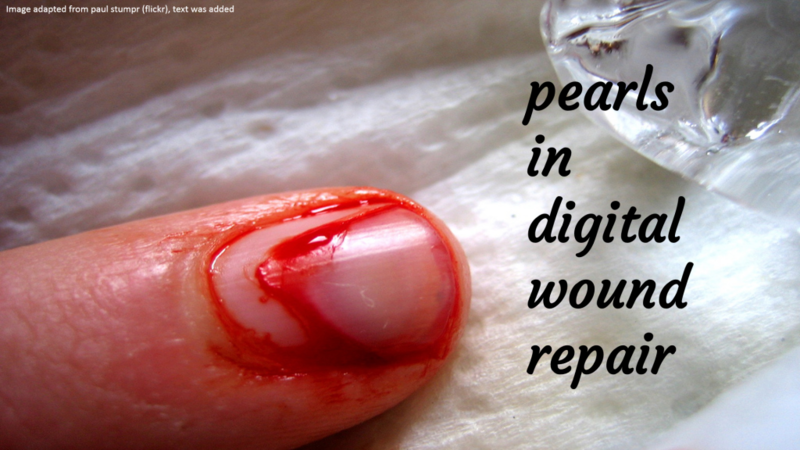 It can also be used to tamponade bleeding on another finger if you have multiple digits involved, and will also let you quickly move to block and tourniquet that finger for repair when the time comes. Start by sizing the patient’s non-involved hand. When in doubt, use a tighter fitting glove. Gently put the glove over the hand of the involved finger. 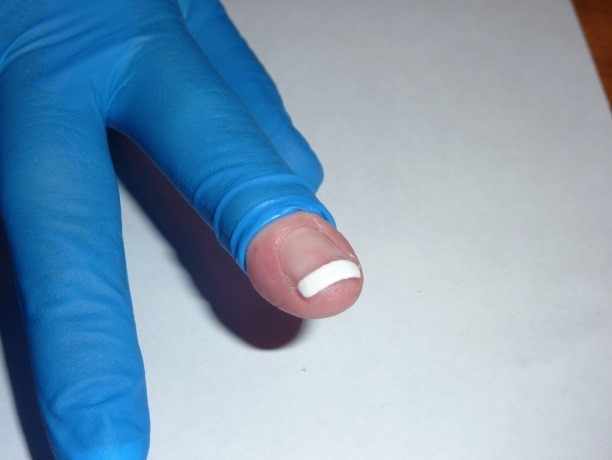 Gently roll back glove until you reach the proximal end of the finger, blotting the bleeding areas gently to ensure you are achieving hemostasis (fig. 2 and 3). Consider different needle types. There is a big difference between the size of PS-3 and FS-2 reverse cutting needles. Both of these are available with 5-0 Prolene and Ethilon sutures, which are great for finger repairs. I like having a larger needle available to bring a flap back into approximation, but find that the smaller P-3 or PS-3 needles are awesome for very small, clean linear wounds. Regardless of what your ED has available, explore a couple of different options and remember that not all 5-0 non-absorbable suture is attached to the same needle. It sounds like minutia but makes a huge different in your efficiency and ease of the repair. With any small flap, I also remember the phrase “ship to shore” to remind myself that the free-hanging flap (the ship) should be needled first and then slowly brought to the anchoring skin (the shore), in that order (fig. 5). I also like wearing some variety of white-colored and tight-fitting sterile gloves to both facilitate dexterity and also make it easier to create visual contrast with suture material and the patient’s gloved hand. Finally, keep that basin of saline and gauze pads nearby so that you can blot and repair as you go. 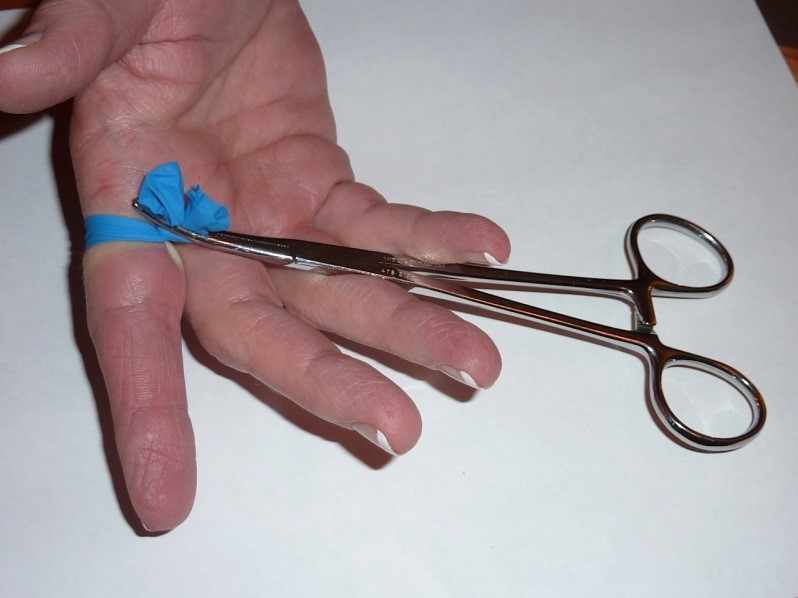 Don’t forget to remove the tourniquet immediately upon completing the repair, checking for final hemostasis. This is important, so I will repeat: remember to remove the tourniquet! I would love to hear any other thoughts or comments you have about finger repair. Either comment below or find me on Twitter at @JoeKennedyEM with any tips/suggestions. Special thanks to Dr. Ben Sandefur and Dr. Theresa Tran of the Mayo Clinic EM program, Dr. Alison Kapadia of the Dartmouth-Hitchcock EM program, and Dr. Daniel Thum of the Mayo Clinic Anesthesiology residency. Each has provided me with unique guidance in learning about digit repair. Additional thanks to Dr. Daniel Cabrera and Dr. Cameron Wangsgard for their review of this entry, and to my mother, who graciously took time out of her Thanksgiving vacation to serve as a hand model.